Move over, brass—copper is the metal of choice this holiday season. The rosy hue instantly warms up kitchens and dining tables as the temperatures drop, and makes for the most beautiful host gifts, too. 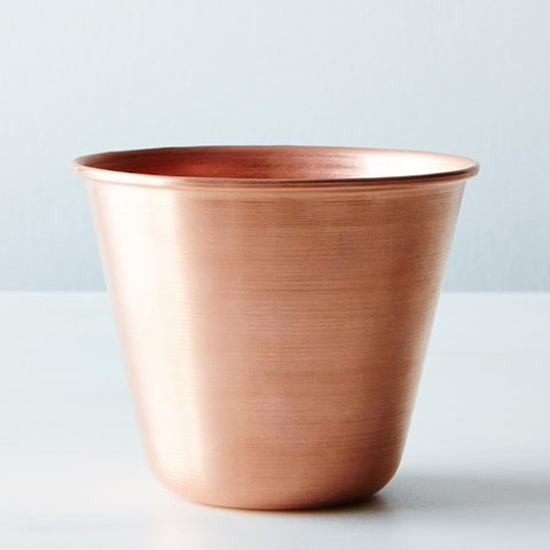 Read on to find out what copperware pieces we’re loving now. These bottles are beautiful enough to leave out as a centerpiece on your kitchen table. Give them as a gift filled with your favorite fancy Italian olive oil and balsamic vinegar. Give your favorite wine connoisseur this gorgeous decanter made with mouth-blown glass and hand-painted copper detailing. These French, shepherd’s-style steak knives are perfect for a chic dinner party or as a gift for the home cook in your life. Pair this beautiful server with a pie or cake from your favorite bakery as a thoughtful (and delicious) host gift. Handspun from raw copper, this cup gets its name from the popular vodka-ginger beer cocktail, which is typically served in a copper vessel. Use this pitcher to serve spiked eggnog to the adults and hot cocoa to the kids. Made in Indonesia, designed by Italian architect Matteo Thun, and created with exotic palisander wood and solid copper, this serving set makes for an epic host gift. These utensils are glamorous yet unfussy, not to mention dishwasher safe for easy post-party cleanup. This mug combines copper and brass for an old-fashioned aesthetic with a modern twist. Fill them up with a whiskey-and-ginger or chai tea.